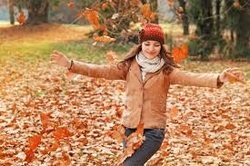 A fall cleanse puts us in tune with the seasons and our environment. For thousands of years, traditional healing practices have recognized a link between the change of seasons and our bodies. Fall is a time of natural transition and an ideal moment for a detox cleanse that will reset your body and mind, and prime your system for a winter of wellness. This safe and effective 8-day cleanse includes Ayurvedic herbs, a diet of whole fruits, grains and vegetables, and warm oil self-massage. You will eat three meals a day and enjoy a pranayama, meditation and light exercise. It is highly recommended to clear your schedule as much as possible so you are able to make this a restful and contemplative week. I will lead an optional restorative yoga class for participants during the cleanse to help you stay tuned in and on course. Pick up your shopping list, menu ideas and cleanse kit. ...includes herbs, cleanse kit, daily emails, optional yoga class, community support and more! TAKE ACTION! Save $20 when you register by September 15. Make your health investment today.